In late spring the flock of sheep are shorn. The fleece weighing between four and eight pounds, stays in one piece after shearing being held together by the natural oils and structure of the fibres. The true colour of the Jacob sheep is black and cream, but during the summer the sun lightens the tips of the black fibres to a rich golden brown. It is the variation of colour in the dark patches that gives the depth to the brown of Jacob wool. When shearing is finished, each fleece is sorted by hand to separate the dark and light colours. The hand sorting is not precise in the separation of the colours and this slight mixing of dark with light gives a characteristic marbled effect to the finished yarn, quite different from the flat colour which is achieved by commercial dyeing . The fibres are sent to a mill in Wales and Yorkshire where it is spun to Double knitting and Aran weight yarn. The spinning produces cream, brown, taupe, grey, black, and black/brown white fleck. No bleaches, dyes, or harsh chemicals are used in the process and because the fibre is from one clip of a single flock, the colours tone perfectly when made into garments. The theme for the annual collection is set, this year based on traditional patterns and textures from Aran, Channel Islands and Fairisle using wools, many naturally dyed colours. Concept designs are sketched, and many small samples knitted. When a set of colours , textures and patterns are found just right for the concept the design is finalised. A full size chart is made, giving the exact position of each stitch and colour and translated into text in the form of a knitting pattern. The next step is to send the yarn and instructions to my knitters. Hand knitting is becoming a rare skill and the garments in my range demand a very high level of skill if they are to be made perfectly. 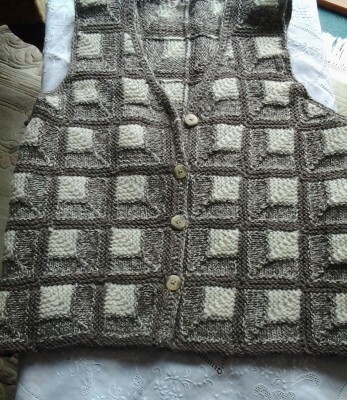 The garments are made by knitters trained by myself who live in various parts of the UK. Items are made to order for individual clients and take eight to twelve weeks . 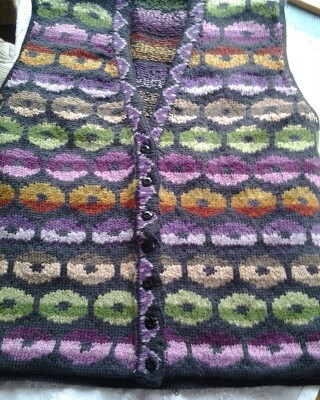 If you are interested in me designing a one off garment for you then please email or ring me. So where do I get my design theme inspiration from it is from my research into the COLOURS AND TEXTURES OF NATURE. for colour, shape and pattern. TREES in relation to their bark, leaves, decay, fruits and fungi that grow on them. THE SKIES in relation to the times of day and weather. CHANGING SEASONS, the colours of spring, summer, autumn and winter. CHANGINF LIFE, birth to death of insects and plants including decay. CHANGING SEASHORES, TIDES, SAND, ROCKS, REFLECTIONS AND RIPPLES. UNDERWATER LIFE CORAL,SHELLS,FISH,ROCKS AND MINERALS. I keep a sketch book of my research and lots of stitch samples so that i CAN USE WITHIN MY WORK. Some of my designs are available as a kit with instructions and the yarn to complete the garment, full details on my Etsy shop.